Phew! what a crazy busy trip! Cebu, Tagbilaran, Talibon, Zamboanga, Legazpi, Seoul Korea and two races all in 28 days. Been back three days and finally had the energy and pain free enough to get on my bike for a 60 miler today. It was great to see my friends and family as I haven’t been back home in 5 years and was also great meeting so many more triathletes and supporter along the way. We left San Francisco on July 16th just three days after Vineman 70.3 so my recovery week was mostly spent packing, doing last minute errands and traveling. We arrived in Tagbilaran on Friday the 18th after 28 hours of traveling and met up with my FB friend Marvin Mariano who had found a 3 bedroom apartment for my family and arranged some great training partners as well. I really wanted to to a light ride so we headed out into the hot and humid afternoon. Within 2 miles I got my first flat tire of the trip. After a quick change of tube we headed out again and immediately got my second flat tire! I borrowed a wheel from one of Marvins friends and finally got a few miles in before dark. The next morning I noticed that I had a third flat tire! If ever training in the Philippines bring Continental 4000 GT’s!!! Next to impossible to find them there during Ironman 70.3 pre weeks so I would Like to thank Roehl Rosales for picking up two for me in the states and bringing them when he came! Training is BEAUTIFUL in the Philippines. Very hot and very humid but beautiful! 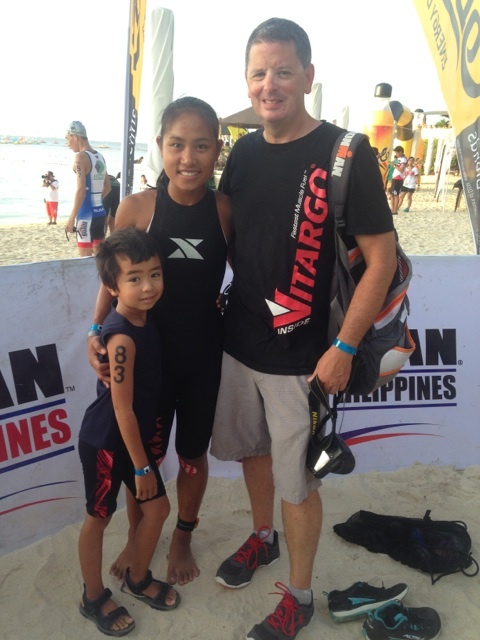 Thanks to Paul, Iain, Marvin and other that I met in Bohol for the great training rides and swims. The climb through the man made forest was both challenging and amazing. I would however really like to change the ride back home. It was this ride back home that I had a very unfortunate crash that I am thankful to survive. A very busy road into Tagbilaran and a instant that I lost focus while drafting and clipped the wheel in front of me that sent me flying into the opposite lane of oncoming traffic. No cars fortunately but a wood railing, a tree and a concrete wall where staring me down. I didn’t have time to react and the other riders and my husband/coach who was following on a motorcycle said my rear wheel was off the ground and I flew over the handle bars missing the tree and concrete wall but taking the hit on the wood railing was my chest and right leg at 25 MPH. I don’t remember very much but the pain and no ability to breathe. My bike amazingly only suffered a broken base bar and a minor scratch on the derailleur. The bike went back on the motorcycle and me in the truck. So frustrating for this to happen 10 days before the race! My week recovery from Vineman turned into 3 weeks and my husband was questioning whether I should race as I still could not ride or run without a lot of pain in my right knee and thigh but we agreed that this was a lot of travel and expense to NOT race. 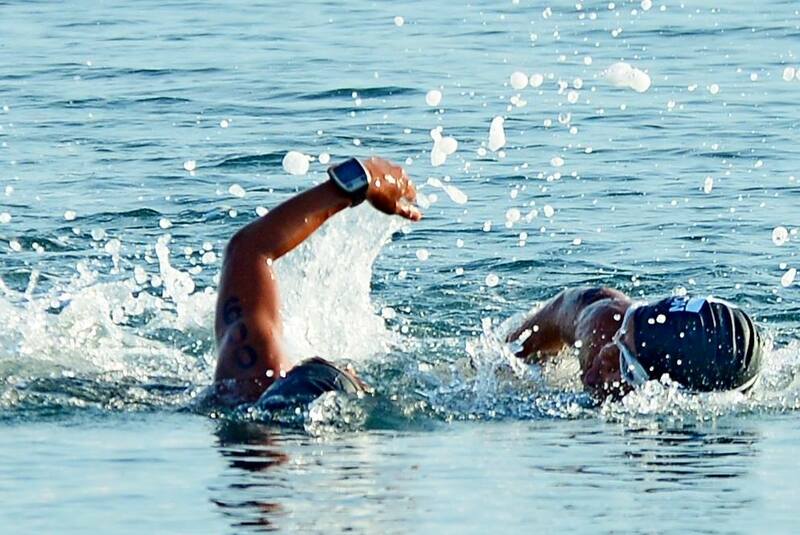 Race day came with the swim start from the beautiful beach at the Shangri La resort in Mactan. 1000’s of spectators lined the streets and transition area and the race start was still over a hour away. Pros and Filipino elites which was the category I raced here all started in the first wave at 6:30 and by the middle of the swim I could tell my leg was going to give me issues and with Jenny Guererro a great swimmer and biker and Joyette Jospson a great biker and runner I already knew this was going to be a tough race. Jenny was first out of the water and I was 3 minutes behind her and Joyette 7 minutes behind me. A 200 meter run to transition and it was onto the bike and a relatively flat but windy and technical course with 8 very sharp and tight u turns. It was a very frustrating bike leg for me as I never did get into a rhythm. My leg was cramping had no power. My watts are usually 190 to 200 for a 70.3 and I could never get above 170 so was pretty sure that I wasn’t gaining on Jenny and most likely losing ground to Joyette as the race progressed. I was shocked and excited when I passed Jenny about a mile before transition and worried as I headed out to the run as was informed that Joyette was now only 3 minutes back. I gave it everything I had for the 13.1 mile run. It was very hot, I lost my hydration bottle and drank coke and gatorade and even tried a gel! YUCK!!! I need my Vitargo. I kept looking over my shoulder because I knew coming in that Joyette was a better runner than me and wasn’t sure it I had the lead I needed. At the turn around she was only 1 minute behind. 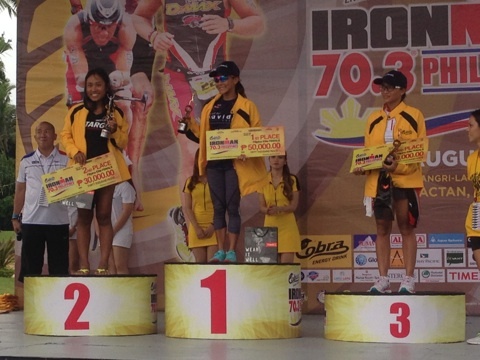 I pushed and pushed but with 500 yards left Joyette did pass me and finished as the women’s Cobra 70.3 Filipina Elite Champion. I came in second and Jenny was 3rd. The race was a blast and a big thanks to Joyette and Jenny for pushing me to do my best. Congrats to you both and I hope to be back next year. By the way. Many athletes tried Vitargo this week and LOVED IT LOVED IT! It will be available in USA form in the Philippines very shortly as my husband is partnering with Jung Cases to distribute in in the Philippines. We have a number of outlets already established in Davao, Bohol, Cebu and Manila. Vitargo Race, Vitargo Post, Vitargo Regular and Vitargo Women’s specific will be shipped out in the next 10 days. I am so excited for as many of you to try it as possible as I know you will have the same experience with it that I have had the pleasure of having for the last 2+ years. Thanks also to iRT Wheels the best wheel company and team on the planet! Thanks to Qunitan Roo for the wonderful bike I am enjoying this year! Thanks to RockTape for holding me together!